Jade Glass Award Beveled Sail with Aluminum Pole 3/16" thick. Cardboard gift box included. 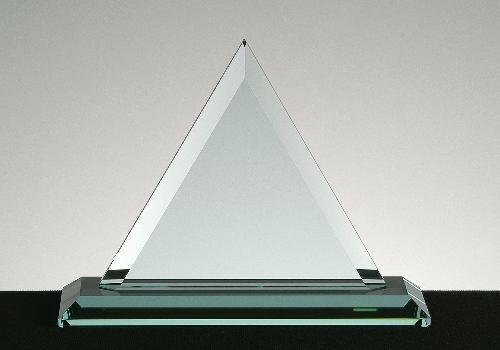 The Beveled Summit Acrylic Award is featuring a double sided bevel to accentuate its distinct summit appearance, and help to make it an absolutely outstanding achievement award! This classic is hand crafted from acrylic and hand polished to meet the highest standards! Available in your choice of blue, red, green, gold or purple reflective bottom! This beautifully crafted award features hand routed curves that give it an elegant look and feel. This product provides plenty of room for custom laser engraving, Acraprinting or both which makes it a perfect award for any commemorative event. Available in two sizes and your choice of blue, red, green, gold or purple reflective bottoms. 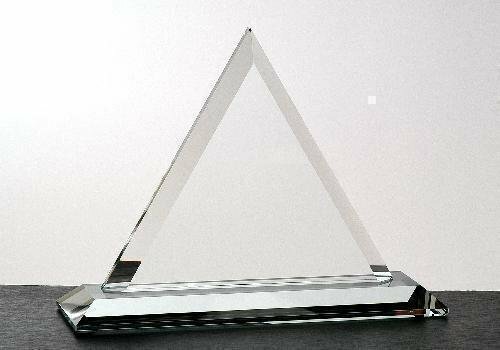 Beveled Triangle with flat polished bottom- Crystal Clear Award. Available in three sizes. Elegant mitered base. This acrylic award is beautifully crafted and features a simple, traditional design with dual bevels. Available in three sizes and your choice of blue, red, green, gold or purple reflective bottoms. Optical Crystal Beveled Triangle Paper Weight, perfect as a corporate gift. Foamed Gift box included.